Our outdoor sign is now fully installed! Previously the "Eyecare + Eyewear" portion had yet to be installed. We're excited to share our brand and image to passers-by on Q Street near 192nd Street. For those of you who are just finding out about our new practice, in prepration for opening, I'd like to share a few thoughts related to our name. For those Shakespeare buffs, I present the question "What's in a name?" In Shakespeare's Romeo and Juliet, the phrase was to portray the idea that their surnames were meaningless and it was their love that truly mattered. Conversely, due to the value of "names," both Romeo and Juliet ended up dead, so perhaps names matter a little bit! Therefore, I'd like to talk a little bit about how our name was selected, and what we intend for it to represent. This obviously is the main portion of our name, and how most people will recognize us (and hopefully use in referring their friends and family to us!). First and foremost we realize that it is a homophone to the word "Modernize," and in fact we really like that! It portrays the action of becoming more modern, which we feel is an opportunity available with each new pair of glasses. We are still in the process of selecting all the eyewear frame lines that we will have available, but our name indicates our guiding principle: we want eyewear that is currently relevant. Also, in practice, the act of "modernizing" sometimes means pushing people towards the edges of their comfort zone, so we want to have options available that you can't get everywhere. Don't worry, this doesn't mean that all of our glasses will be crazy or "out there!" It does mean though that we will look to mix in some brands that you are not familiar with alongside those that may already be familiar. Ultimately, we want to have glasses that fit many different face shapes, personalities, and lifestyles! 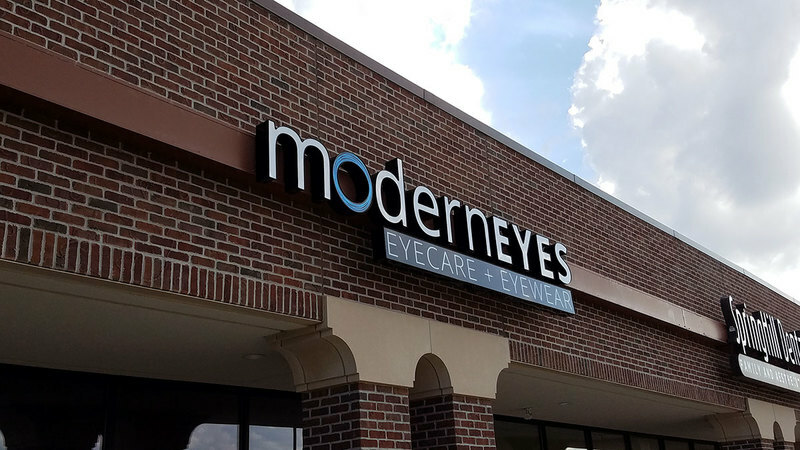 Now the fact that we switched "Modernize" to "ModernEyes" is because we want to indicate that we are focused on your eyes. But we're not the only ones: almost everyone focuses on eyes! Let me explain. Much of communication is non-verbal, and of that non-verbal communication a good percentage of it is with your eyes. Where you are looking, eye-contact, or even the teenager rolling her eyes are all means of communication. Even minute details related to the muscles in your face surrounding the eyes can indicate things such as happiness or anger. With all that attention to your eyes, they better look good! Furthermore, you need to have clear vision in order to see those details in others. Those are areas in which we can help fill the void! This is our primary reason for existance. Though glasses frames may be cool, it all means nothing if you can't see clearly out of them or that your eyes are unhealthy. We prioritize this above all else. We specifically chose the word "eyecare" because it best indicates the full scope of how we intend to help you. We will take time and care to educate each person so that they can be best prepared to care for their eyes in-between eye exams. This may happen in explaining how certain lens choices may best fit your lifestyle, outlining proper contact lens wear procedures and why they matter, or even how to best manage a particular "red eye" issue that you've been dealing with. We certainly don't expect everyone to be eye experts, and that's why we are here, to come alongside you and help you every step of the way. We've already discussed this part a bit in the "ModernEyes" section, but I want to highlight one more aspect: the "wear" in eyewear. Ultimately, nailing down your perfect prescription doesn't do any good if you don't actually wear your glasses or contact lenses! While we can't 100% control that, we do want to provide options that are so compelling that not only will you be not embarrassed to wear it, but instead you will be proud to wear it. Your eyes deserve it!